where database is a range reference to the Excel table, field tells Excel which column in the database to look in for the largest or smallest value, and criteria is a range reference that identifies the fields and values used to define your selection criteria. 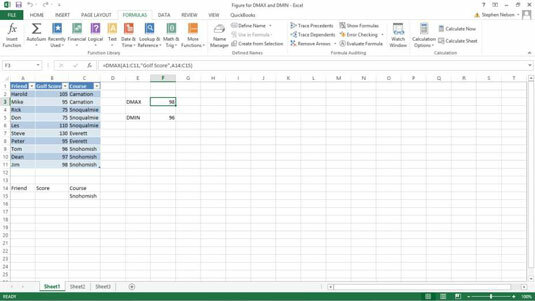 Excel provides several other functions for finding the minimum or maximum value, including MAX, MAXA, MIN, and MINA. As an example of how the DMAX and DMIN functions work, suppose you construct a list of your friends and some important statistical information, including their typical golf scores and their favorite local courses. Row 1 stores field names: Friend, Golf Score, and Course. Rows 2–11 store individual records. Rows 14 and 15 store the criteria range. Field names go into the first row. Subsequent rows provide labels or values or Boolean logic expressions that the DMAX and DMIN functions use to select records from the list for counting. For example, note the text label in cell C15, Snohomish, which tells the function to include only records where the Course field shows the label Snohomish. The function finds the highest golf score of the friends who favor the Snohomish course, which happens to be 98. The function counts the lowest score of the friends who favor the Snohomish course, which happens to be 96.